Standard knurled stainless steel grip, 30 mm in diameter and 50mm in length. Comes with two drives, long and standard lengths to fit all conventional tattoo machines. Each grip is tested to fit all T-Tech cartridges. 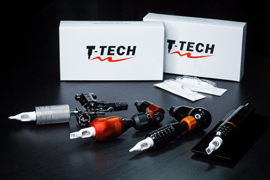 T-Tech grips are made with Type 304 and Type 316 surgical steel and are designed to save time. A bayonet socket is set at the end of each grip makes it compatible with T-Tech needle cartridges. The grips are solid and do not contain any hinges, allowing for better scrubbing and ultrasonic cleaning. All grips are fully autoclavable.